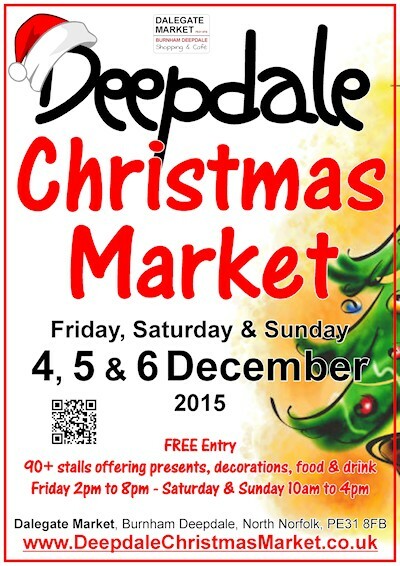 Deepdale Christmas Market takes place on Friday 4th, Saturday 5th and Sunday 6th December 2015. Gates open at 2pm on Friday 4th until 8pm that night, then again from 10am to 4pm on both Saturday & Sunday. Deepdale Christmas Market is based around the Dalegate Market shops & café, and amongst the pews in St Mary’s Church, both in Burnham Deepdale on the beautiful North Norfolk Coast. That website also has a full programme of entertainment. Why not enter our Christmas Hamper Competition, win one of four amazing hampers donated by the stalls and shops.